Mash garlic to a paste with a mortar and pestle. Mix chile pepper sauce, maple syrup, soy sauce, mayonnaise, and rice vinegar into garlic until marinade is thoroughly combined. Transfer chicken thighs to a large flat container (such as a baking dish) and pour marinade over chicken; stir until chicken is coated. Cover dish with plastic wrap and refrigerate about 3 hours; if preferred, let stand about 30 minutes at room temperature. Unwrap dish and sprinkle with salt. Preheat charcoal grill to high heat. 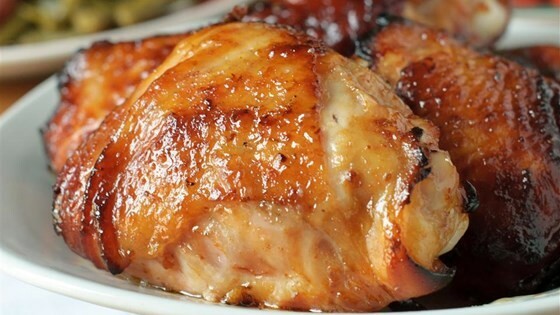 Place chicken thighs onto the hot grill with smooth sides down. Cook until chicken shows grill marks, about 3 minutes. Turn chicken over and cook until other side shows grill marks, about 5 minutes. Continue to cook, moving them occasionally and turning over every 2 minutes, until meat is no longer pink inside and the thighs are golden brown, 10 to 12 minutes. Transfer chicken to a platter, let rest for 5 minutes and serve garnished with lime wedges (optional).